I’m kicking off the new year with an interview with someone who I’ve had the honor of getting to know over the past year, Scott Barry Kaufman, and have been looking for an opportunity to get him on the show for some time now. 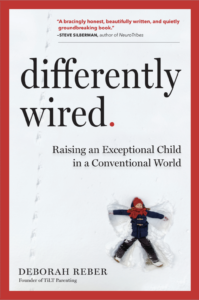 Scott joined me and Marcus Soutra of Eye to Eye at my NYC Differently Wired book event this past summer and shared his personal story of being labeled and underestimated as a result of his learning difference when he was in elementary school and and middle school. Today he is a psychologist, author, and podcaster who’s interested in helping all kinds of minds live a creative, fulfilling, and meaningful life. Scott has a Ph.D. in cognitive psychology from Yale University, and is currently based at Barnard College, Columbia University where he is exploring the depths of human potential. Scott is also a prolific writer, having written the books Ungifted, Wired to Create, Twice-Exceptional, and more, and he’s a regularly writer for the Scientific American. Scott is incredibly passionate about what he sees as his primary work in the world—changing, or perhaps expanding, the way intelligence is defined and measured. In our conversation, we talk about his ideas about intelligence, potential, and what it actually takes for our children to develop into self-actualized adults. I hope you enjoy it. About Scott: Scott Barry Kaufman is a psychologist at Barnard College, Columbia University exploring the depths of human potential. He embraces a humanistic, integrative approach that takes into account a wide range of human variation– from learning disabilities to intellectual and creative giftedness to introversion to narcissism to twice exceptionality– to help all kinds of minds live a creative, fulfilling, and meaningful life. Scott likes to share his enthusiasm for these topics through his teaching, writing, speaking, and podcast. He writes the weekly column Beautiful Minds for Scientific American and hosts The Psychology Podcast, which has received over 7 million downloads. In Spring 2019, Kaufman will teach the course The Science of Living Well at Columbia University.